Are you unsure of which felt roof shingles are the best fit for your project? 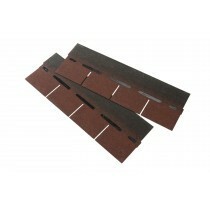 Are you uncertain of which fixings and flashings you'll need with your felt roofing shingles? Speak to our team online via the live chat in the lower right hand corner or call 01295 565 565. We will help you select the perfect shingles for your project and will ensure you have all the roofing materials you require. Felt roof shingles offer an ideal roofing system for sheds, porches, garden rooms, summer houses and timber buildings. Through the use of high quality materials, felt roof shingles can also withstand tough weather conditions and therefore provide a stylish finish for several years. Due to its lightweight nature, felt roofing shingles can be fitted to roofs with pitches as low as 10° with the use of an underlay membrane. Whatever the pitch of your roof, our shingles can be fitted to have an attractive traditional broken bond tile finish. Therefore, felt roof shingles combine a stylish finish with uncompromised longevity. If you have questions about our range of roof shingles, simply speak to our team via the online liva chat or call 01295 565565. We will be able to help you select your shingles from our growing range and advice you on any necessary tapes or nails. With our price match promise and quick UK delivery, upgrading your roof with felt roof shingles will be hassle-free and low-cost.